Talk with your relationship coach today. Join on your own or as a couple. No need to wait for an appointment. Your personal coach will recommend activities, answer questions and encourage you to succeed. All this fun and interactivity is really affordable only $18/month and you can cancel anytime. Just 30 minutes of watching, participating, and listening to the various activities/videos gave us more tools than we had in all of our counseling sessions combined. This site is a godsend. We learned how much anger can hurt a relationship and how destructive it can be. Power of Two helped us create an exit and reconnecting strategy. This is something we needed to do. Dr. Susan Heitler specializes in teaching couples the skills they need to enjoy a strong, long-lasting and loving partnership. 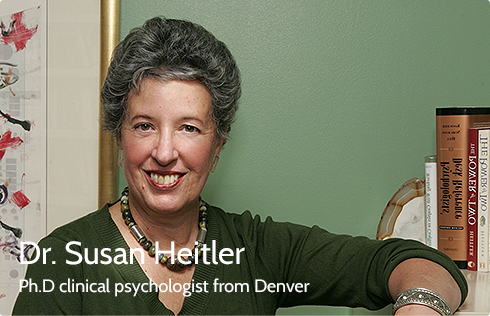 A clinical psychologist in private practice in Denver for over 30 years, Dr. Heitler is a graduate of Harvard University with a doctorate from New York University. Susan Heitler's effect on my life was profound and permanent... She just really helped me put my life back together. The activities were not only educational but really entertaining and well designed. A HUGE and surprising plus. I started the program and found that I had a lot to learn about relationships! My overall review: TWO THUMBS UP! More from the best alternative to marriage counseling online.